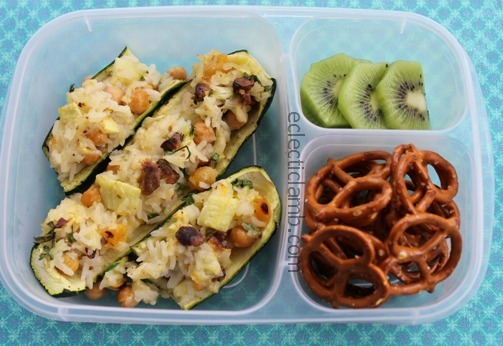 Each of these meals are vegetarian or vegan and contain about 400 calories. 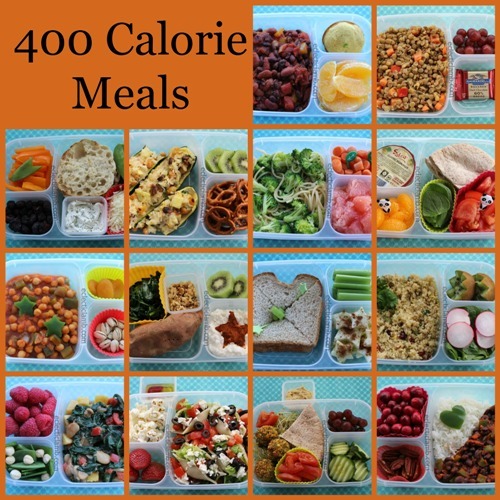 (The calories in these meals range from 347 calories to 450 calories.) 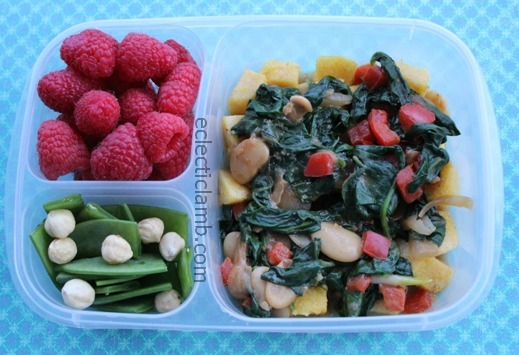 I created this set to show that meatless, low calorie meals do not need to be boring. 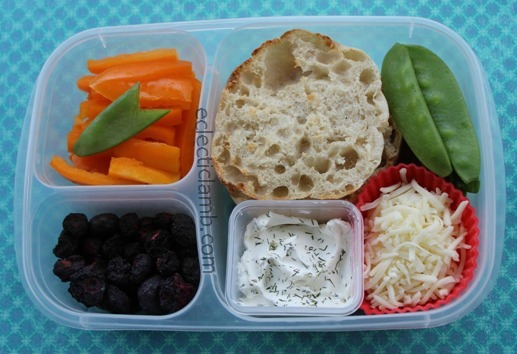 I used EasyLunchboxes and Mini Dippers (when applicable) for each of the meals in this article. I am not temperature sensitive with food. I often enjoy cooked food at room temperature. When I want to heat part of a meal I use silicone cups to make removing an item easy. Sometimes I put the item to be heated in a silicone cup. Sometimes I put the item I don’t want to heat in a silicone cup. I also use silicone cups to separate items. I used a cookie cutter to cut a heart shape from a green bell pepper. It added a fun element to this vegan meal. This recipe makes 6 servings. I halved the recipe so that it made 3 servings. I used a cornbread recipe to make cornbread muffins. 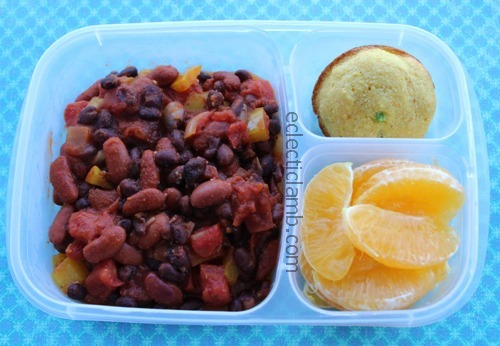 The muffins were delicious with the vegetarian chili. The cornbread recipe makes 16 servings. The optional ingredients in the recipe were not counted in the calorie count so I did not use the whole corn but I did use some jalapeno pepper. I halved the recipe and divided the batter into 8 muffin cups. I baked the muffins for about 10 minutes. I made a few changes to the chili recipe. I only used yellow bell pepper, did not use the brown sugar, and did not use pinto beans. 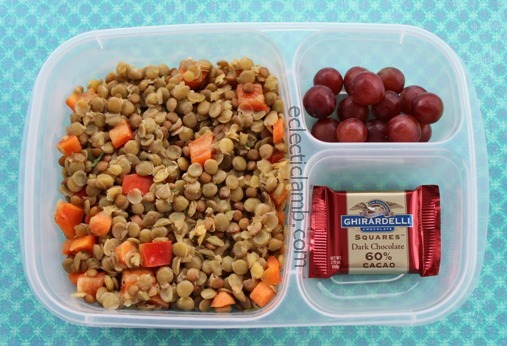 This meal could easily be vegan if you replace the chocolate with something else. The recipe included Dijon mustard in the directions but not the ingredient list. I did not measure but put in quite a bit of Dijon. It added an robust flavor to this salad. I enjoyed making and eating this vegetarian non-traditional pizza meal. Assemble these pizzas at lunch and eat it in any combination that pleases you. I purchased individual packs of Sabra hummus and whole wheat pita to make this delicious vegan lunch. The panda picks added a touch of whimsy. I do not often eat sandwiches with store bought bread but this vegan lunch was quick to make and satisfying. I used celery and star picks as garnish. This vegetarian meal is one of my favorite meals from this article. Usually I make my own polenta but I followed the recipe and used packaged pre-made polenta. It made the recipe quick to make and was delicious. 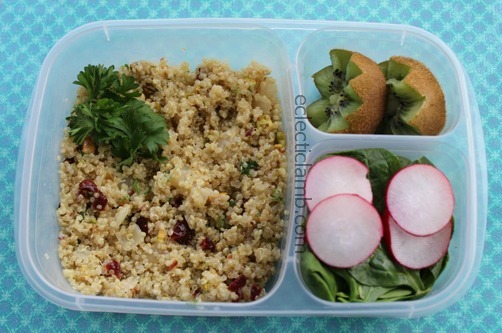 This vegan meal with quinoa made a fulfilling lunch. I made a few changes to the recipe. I used onion instead of shallots, vermouth instead of the white wine, and did not use mint. 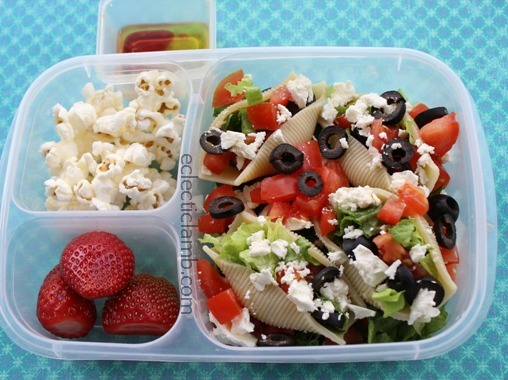 I developed the recipe for these vegetarian salad shells. It was a visually appealing and satisfying meal. Cook extra pasta shells because some will break while cooking. Divide ingredients among pasta shells and place extra ingredients around the filled pasta shells. Combine olive oil and vinegar. 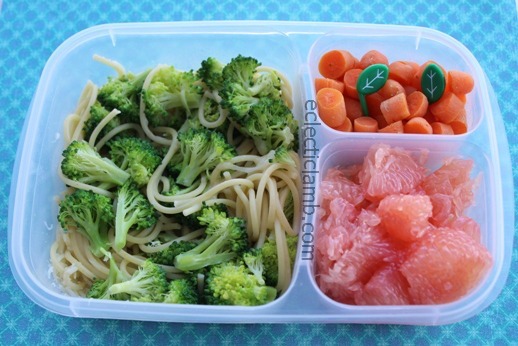 Put in a small container with lid. Shake to combine and then pour over salad shells before serving. 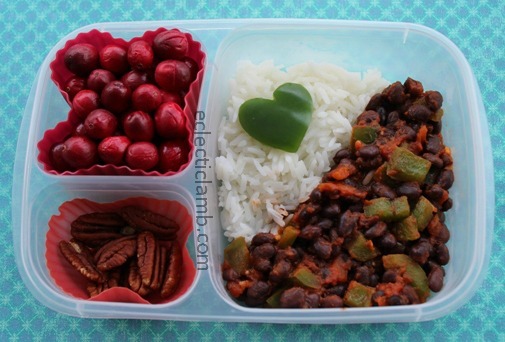 Try this beautiful vegan meal for lunch or dinner. This quick vegetarian meal was easily made with ingredients found in my house. I used a cookie cutter to cut a star shapes from a green bell pepper. 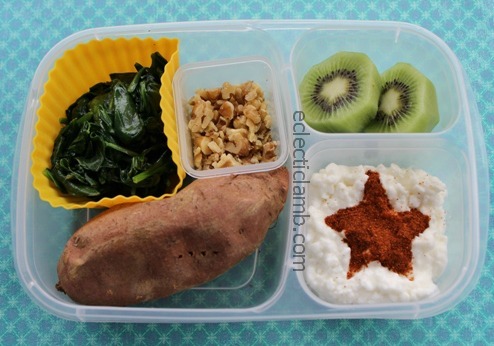 You will feel like a star for eating this healthy vegan meal. In a medium frying pan, heat olive oil until medium hot. Saute onion and pepper until tender. Add tomato sauce. Cook over medium heat for about 5 minutes. Add garbanzo beans. Cook over low heat for about 10 minutes. This vegetarian meal contains many flavors. I created the star shape by filling a cookie cutter with with hot paprika. I made baked Falafel for this satisfying vegan meal. 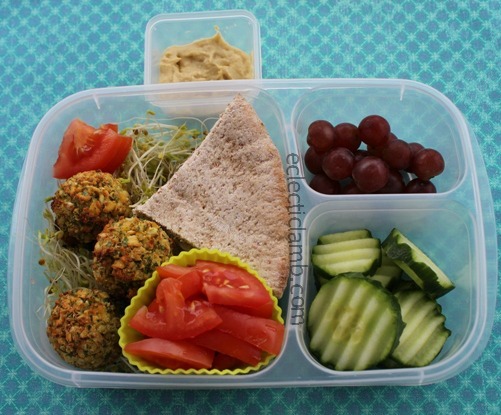 When forming the falafel balls you do need to make them carefully as the recipe suggests. I used a small ice cream scoop to form the Falafel. I am not a nutritionist. I planned these meals based on previous knowledge and internet research. Since many sources have varying nutritional information for the same item, I do not guarantee the calorie counts. For many of the recipes I used my food scale to weigh items. If you care about calorie counts I recommend buying a food scale. 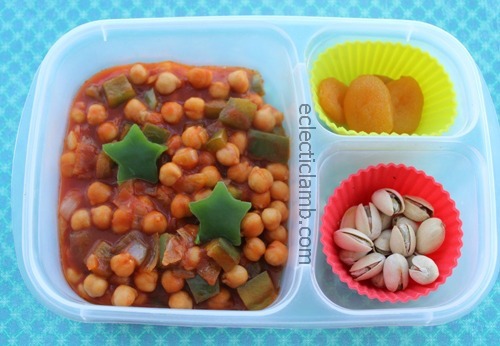 If you do not have a food scale, you can make the same meal in an EasyLunchboxes. You can then reference my photos for food quantities when making your meal. 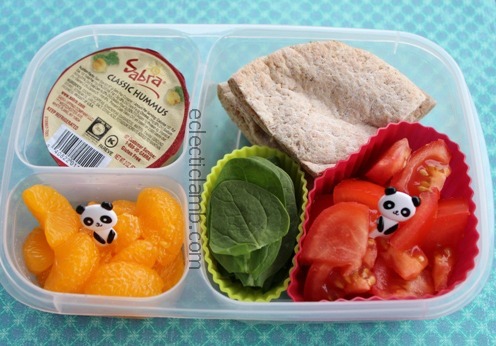 This entry was posted in Bento / Cute Food, Food and tagged 400 calorie, bento, dinner, lunch. Bookmark the permalink. Thanks for this. Hubs likes his veggies and this just gave me a ton of ideas on what to make him. I am so glad to hear this. Thanks! Wow! Not boring at all. YUM!!! Thank you for this wonderful collection Kathy! I love how varied and delicious they all look!! And as a fan of meat I can tell you I probably wouldn’t miss it all that much if I got to eat these! Thank you so much! They were so much fun to make and eat. Wow! 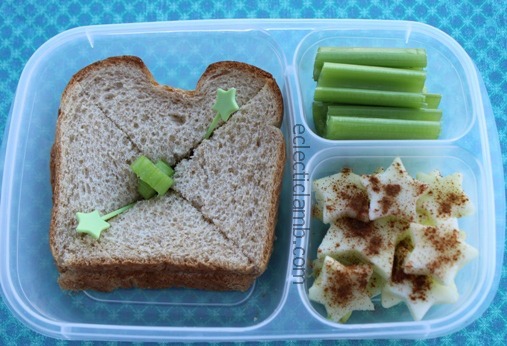 These look delicious and love how healthy they are too! Thanks for sharing! Parmesan cheese isn’t vegetarian. It is made using animal rennet.